World Table Tennis Day (WTTD) is an annual international holiday dedicated to one of the most popular sports in the world. It was founded in 2015 by the International Table Tennis Federation. Table tennis, also known as ping pong, originated in Victorian England. The name “ping pong” was officially trademarked by J. Jacques & Son, a family company that manufactures sports equipment, in 1901. The International Table Tennis Federation (ITTF) was founded in 1926 to oversee rules and regulations of table tennis, facilitate its technological improvement, and organize a number of international competitions. Today, table tennis is widely played on all inhabited continents, both amateurishly and professionally. Competitive table tennis is especially popular in Europe and East Asia, although it has been gaining popularity in the United States, too. World Table Tennis Day was founded in 2015 to celebrate table tennis and promote a healthy lifestyle around the world. Table tennis is a sport for people of different ages, genders, skill and fitness levels. It helps to bring people together and thus contributes to social cohesion and social inclusion. 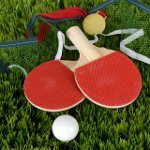 World Table Tennis Day is celebrated on April 6 because that day was established by the United Nations Organization and the International Olympic Committee as the International Day of Sport for Development and Peace.